We are all creatures of habit, and changing 30+ years of fully-ingrained habits is about as easy as putting together anything from IKEA – there are always screws or bolts left over that you know should have been included, but you can’t figure out where they were supposed to go. You’re left with the sinking feeling the whole thing is going to fall apart at the worst possible moment. The six months of semi-retirement was supposed to help me with a big part of the adjustment – or so I thought. I was wrong, and I admit it. Even working 2.5 days per week had work still dominating my thoughts and non-workday routine. No matter how often I told myself to not think about work, small thoughts, ideas and worries crept in like insects. I went through my non-work tasks with one part of my brain not fully engaged, and would frequently stop what I was doing to write a note about something that needed to be done the next work day. Pitiful, huh? Now I know why my husband was so supportive of my retiring first. He didn’t want to have to figure this stuff out on his own. I had gotten very used to my routine – a super long weekend and then three pretty packed work days. My first day of retirement, ironically, fell on the day I usually started my work week. It felt very, very strange to be at loose ends on a Tuesday. My habits were completely disrupted, and I was at a loss. I initially made the mistake of going through my list of things to do, and tried to change my daily routine cold turkey. That was a mistake. I experienced an almost overwhelming mental paralysis and I couldn’t concentrate on even things I loved to do. I wondered if I had made a mistake leaving my comfortable stress-filled existence. Ah, the angst of a Catholic-educated, Type-A ambivert. No one does guilt better. After wallowing for a while, I told myself this was a normal reaction to change, and I need to figure out a way to get past it. The best analogy I could think of was my brain-screen was frozen. I realized a complete reboot was in order. I decided I would do absolutely nothing for as long as I needed to, and let the paralysis run its course. I read several good books. I ran errands, and took walks. I cooked some pretty fabulous meals. I puttered in my garden. I did absolutely nothing that needed any concentration, thought, or planning. I needed that time of inactivity to reset my brain and completely divorce myself from my previous routine. The past few days I’ve started working on a new program. I’ve been able to draw and write. My concentration is returning. My volunteer commitments don’t seem overwhelming any more. Most importantly, I’m not making the mistake of thinking I can do this all at once, or that what works today won’t change tomorrow. I’m settling in, and allowing myself to explore different things. Some will work well, others won’t, and I’m OK with that. 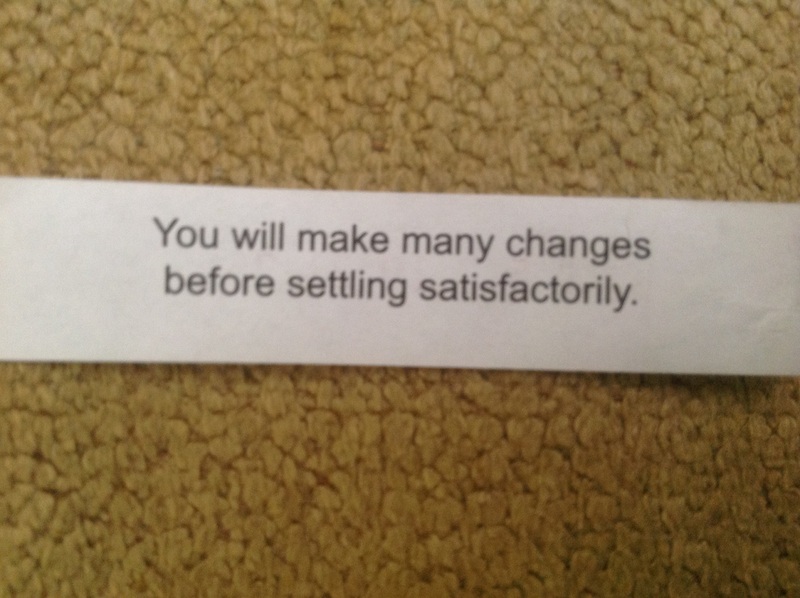 In fact, I think the next few months are going to be summed up by something I found in a fortune cookie recently. You find wisdom in the most unlikely places. Posted in Retirement Transition and tagged Baby Boomer, Boomer, Late Boomer, retired, Retirement. Bookmark the permalink. Colleen – Brilliant! I too am a Catholic-raised Type A. And I have survived my first year of retirement. Survived is an interesting word, as it does capture the downsides of a complete change of routine, loss of identity, and need to find a new way of life. And, unfortunately, after a year I am still working on a new routine. (I’ve always been a slow starter.) Some days are better than others…or I should say most days are good. (Be positive!) But I still have those days when I cannot seem to do anything (paralysis), or everything feels overwhelming, or everything feels like it’s “busyness to be busy”. I forgive myself those days and regroup – think about what I want to do to make myself happy in this new life, what are my barriers to making that happen, and what can I do to break those barriers. I am a planner, so that approach helps me on those “bad days”. Today started as a bad day…so I listened to a bunch of Ted talks about making choices, taking time off and what regret means. And your phrase “allowing myself to explore different things. Some will work well, others won’t” encouraged me to relook at my Possibilities List for something new to explore, as well as review what I have explored this past year – which gave me a feeling of accomplishment. Thanks! Glad I could help! I know this transition is different for everyone, and there isn’t a one-size fits all way to handle it, but I’m firmly convinced there are some common denominators. Sharing experiences along the way will only help all of us. Thank you for the validation that this is “normal”. I kept telling myself that, as I was going through the paralysis, but hearing it from someone else really helps. Thanks for the warning that it may return at times – knowing me, I’ll also freeze again at some point. I’ll file that away too, and hope it makes the freezes shorter. My long time mentor (also named Pat!) told me a few weeks ago when we chatted that it would take a considerable time before I have an established new routine and not to “beat myself up about it” (she knows me only too well…) but to go with it and adjust along the way. I’m going to certainly give it a try. It will be interesting! Welcome to The Life Retired. I’m three years in, over the post-working hump, but still busy being busy with ever more fanciful retirement projects (e.g. : why not sample a bottle of wine made from every variety of grape ?) Relax and Enjoy! I like your style, Spencer. We started on that several years ago. Our wine room is full, and we do enjoy on the weekends! Hmm. Post-working hump is an accurate way to describe it. Thank you! Wine ROOM. I am impressed! We live in Northern California, in driving distance to some of the best wineries in the world. A wine rack simply will not do. I envy that you have a year or two of retirement before your husband joins you. My husband had two years under his belt before I retired and, when I did, he was ready to GO! I, on the other hand, wanted to ease into my new life. We’ve worked it out pretty well, but I’d still like more “me” time. I still can’t believe my luck to have been able to leave work (I’m definitely not a type A) and I’m enjoying my freedom. It will probably take you awhile to settle in but I predict that in your blog on your 1-year retirement anniversary, you will extol the wisdom of your decision. Thank you! I certainly hope so. I’m glad I started this journey first, because my husband, like most engineers, can be a bit of a lost soul when confronted with change in his routine. He thinks he’ll have no problem retiring, but we both know he’s going to need to do some preparation first. He’s starting to think about what he’s going to fill his days with when it’s his turn, and that’s positive. He’s been very supportive through all of this, and said the wonderful dinners he’s been getting with all the extra time I now enjoy have been worth it. I’m going to start posting recipes pretty soon. Colleen, your husband is welcome to follow retiredblokes.wordpress.com – just the place for those of us trying to navigate through retired life without a compass. Hi Spencer – I have already followed your blog in my reader for just that purpose. He read a few of your latest posts and loved it. You have a new fan in California! Thank you. I once dipped a brief toe in northern California on a day trip from Nevada, where I was reporting on a world title fight for my newspaper. Beautiful place (not Nevada). Congrats on switch – a month in, what sort of creative projects are you working on? Formally retired I am not, but being self-employed I find that having a bunch of things going at once means a to-do list that lets me sort of drop in on ideas that I find fun and engaging rather than feeling obligated to do specific things. Hello Joe! So great to hear from you. I hope you’re enjoying the self-employed gig. I’m an art student now, and am studying twice a week with a very talented artist. I’m working on my drawing skills one class, and I am in his oil painting class, but am working in pastels right now. I’m learning by copying the works of the Old Masters, and it is very challenging. I need to be able to replicate the human body, so my challenge this month is to recreate the self-portraits of Van Dijk and Vélasquez. The many layers of pastel is great training for painting in oils, which is what I want to eventually do. I’m the newbie in his class – everyone else has studied for years, and they’re very supportive of the fact I have only been doing this 3 months. At home, it’s lots of practicing and studying the technique books. I am still working on my two major volunteer commitments, but those aren’t too time consuming – I am working with amazing people on both committees. Add domestic chores and a mother in law who has some health issues, and my days are as full as they were when I worked. Ah cool, well that’s good to hear…I’ve found that doing something completely different usually tweaks the brain in a useful way (I bought myself a drum set last month and realized I didn’t know much about rhythm). Glad you are staying busy though, I can’t imagine you not learning & moving & thinking.